Remember that headlamp that you used to use before you got your new one? Have you stopped camping but still have a tent taking up space in the back of the closet? Are you looking to acquire something new? Join us at the April TriTrogs meeting, where our program for the night we be a Gear Swap! Any items that can be classified as ‘Outdoor Gear’ are welcome. Since it will take place at the museum, please use your best judgment when deciding what to bring in and what to leave in your car. If it’s large, a picture will work. When you know what you are bringing, add it to the Gear List so that people have an idea of what will be available! Items can be swapped, sold, or given away. See you there, with gear in tow. What would you do if you won the lottery? I think we all now agree that we would help Michael realize his lifelong dream of swimming through a silo full of coins. In attendance: Ken, Zeke, Matthew W., Kim, Martin, Carlin, Ben, Brian, Michael M., Emily, Peter, Jenny, Eric, and Mark D.
Happy new year! Pay your membership dues. Yearly individual: $15. Yearly family: $22. Pay one of the officers or via PayPal. If you pay via PayPal, please email the treasurer to let him know that you did. Ken read a postcard from Amar and Bithika and young caver Pahi. Awwww. Spring VAR event. April 27-29. Put it on your calendars and prepare to invent an excuse for why you can’t volunteer to help out! Several members with finite storage space have expressed interest in a grotto auction or gear swap fundraiser. Kim has offered to start an online list of items that people might like to be rid of. Items should be limited to caving or outdoor gear. Date and location are still under consideration. Rappel in, walk out. 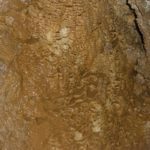 Peter and Mark enjoyed rappelling into Lost World Caverns in Greenbrier County through the original, natural entrance drop and following the walking tour path out. The next day they went to the SSS (???) entrance of the Culverson Creek Cave system. It’s a low, stream crawl entrance, but it opens up into some large passage. They found some stuff to photograph and agreed that it would be worth going back there sometime. They did not navigate any passages that were very tight or very wet. Giggle and bear it. Kim, Eric, Mark, and Ken went back to Paxton’s Cave for day one of the New Year’s weekend. The entrance was a cascade of giant icicles, and the air blowing from the cave felt relatively warm. They made it to the Throne Room in record time and spent the rest of the trip looking for the way to the Christmas Room. They didn’t reach that destination, but the rimstone pool filled with crystal candy corns that they found was the neatest thing Kim has seen in a cave. On day two, while looking for the entrance to Low Moor Cave, Eric discovered a black bear. Eric’s high-pitched scream and subsequent giggle unnerved the bear enough to do the trick, and it promptly left. Once inside, they did a lot of walking, saw a lot of graffiti, crossed a sketchy ladder over a pit, and got Eric stuck in an unnecessary, tight climb. Crash course in frog. 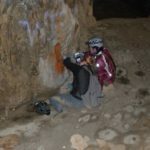 Dave and Carlin roped virgin surveyors Natalie and Andy into the Radon Cave survey trip. Carlin bolted a traverse and found that he could remove the former (20-year-old) bolts easily by hand. They descended a short drop and surveyed maybe 100 feet. There was a pinch that Andy wouldn’t fit through, but beyond it the others discovered the large room that they had been promised. No obvious leads off the big room, but it still needs to be surveyed. 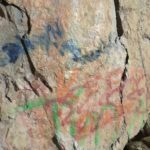 Michael went to a much-visited, graffiti-riddled small cave behind a waterfall in South Carolina. Also, he definitely did not trespass in a [redacted] on [deleted] property in [omitted]. Peter startled a sea lion while cave snorkeling in Mexico. Ben and his wife toured some caves in Vietnam. They spent much of one day hiking to and from a cave with an enormous entrance. Matthew W. wants to lead a photo trip in Tennessee on some 3-day weekend. Ken will lead a photo trip closer to home if there’s interest. Peter’s trip report from the annual grotto trip was submitted to RASS; some day the rest of us might get to read it. We received a certificate for buying an engraved brick as a donation to the NSS headquarters. We’re throwing a grotto holiday party. There might be a slack line and an accordion, but people should come anyway. Someone will resend the signup email. Zeke is now NSS member #68716! Congratulations, Zeke! Almost caving: Michael’s girlfriend recommended Bowden Cave, having been there many years ago. They got there to discover it’s been closed. 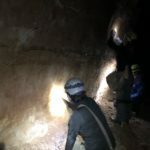 Almost connecting: Mike participated in a dig in the Complaint section in Butler Cave, hauling rock out of a narrow canyon passage. They were puzzled when Mike found a survey station marked F5 in a pit beyond the squeeze; it failed to match the location of the F5 in the old records. As it turns out, a few years’ worth of metric surveying needs to be converted. On the bright side, correcting the old numbers will lengthen the cave. 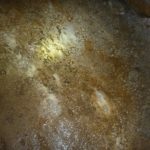 Almost fitting: Michael’s first visit to Hancock Cave exceeded his expectations. He got to see a lot of the cave but was forced to surrender to the Funnel Tunnel. 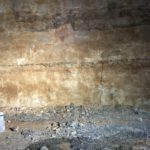 He settled for photographing fossils and a long-dead bat while listening to the gleeful cries that emerged from the other side of the belly crawl. After watching others tackle the awkwardness of the Comic Book Hole, Michael chose to forego that experience in favor of his role as videographer. He’d like to go back and bounce around in the Breakdown Staircase area. 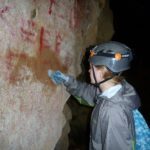 Almost memorable: Natalie couldn’t recall as many details about her group’s visit to Hancock Cave, but she does remember spotting two live bats, which is great since we call it the Hancock Cave bat count and graffiti cleanup. 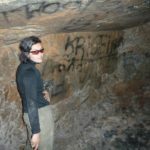 Speaking of graffiti, she discovered that boot soles excel at carrying extra mud that can be used to mask etched signatures. So does Ken’s face. Although she found the Funnel Tunnel exciting, the Breakdown Staircase was Natalie’s favorite part of the trip. Read Ken’s trip report here. Almost comfortable: Mark’s group also approached the Funnel Tunnel in Hancock Cave. After some cajoling, even the most nervous new caver made it through and they were all rewarded by the pretty decorations beyond. 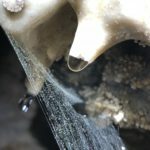 Almost surveying: A group returned to SnoCone Cave with five 4-foot segments of scaling pole and good intentions of surveying beyond a long wet crawl. A hundred feet from the entrance they took the opportunity to check out a high lead above some flowstone. After assembling three of the sections, Mark climbed to the top but still couldn’t reach his target. The scaling pole then bent and quickly deposited Mark on top of Carlin who, having drawn the short straw, was minding the bottom of the pole. No one was injured, but the survey couldn’t go on. At that point they left the cave and did some ridge walking which, even in hunting season, seemed safer than scaling poles. The day after the SnoCone adventure, the group surveyed about 300 feet in Radon Cave. The entrance feature is a blowing, very tight crawl. There’s another 100 feet or so to survey before a traverse and then the back section of the cave reportedly opens up. Some existing rigging, likely from 1990, clearly needs to be replaced. Carlin retrieved the cave registry which was last used in 1995. Peter gave a fascinating presentation about cave biology! Mark led us off with a discussion about the benefits of being an NSS member. In attendance were: Mark (61461), Martin (63470), Zeke (n/a), Kim (new! ), Diana (29990), Mike B. (54738), Natalie (n/a), Lisa (54739), Russell (n/a), Mike M. (65541), Ken (27597), Emily (26175), Eric (68186), and Carlin (60593). Dues. Pay them if you haven’t. Holiday party. Dec. 9 at 6:30 pm at Mark’s house. Kim has emailed out a link for food/beverage sign-up. If you have an aversion to sign-up sheets, just bring a dessert! There will be awards and (family-friendly) entertainment of some sort. Ken brought along a sign that can be re-purposed by the grotto for placement outside the museum on meeting nights. It’s not blinking neon or anything, but it is big and collapsible. Natalie volunteered to try to paint something appropriate on it. Carlin and Diana went to Watoga State Park and met up with some Quebeckers who were well-equipped with food. On Saturday they went to Friar’s Hole via the FH entrance. A camera was lost and, after some extra crawling, found again. On Sunday they went to Norman Cave. The area was extremely dry. Mike and Lisa went to the BCCS annual meeting. 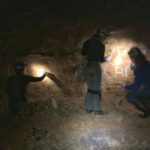 While there they delved into the historic section of Butler Cave, did the sketchy God Is My Copilot climb, and made it to the foot of the old historic entrance. That area of the cave is not accessible from mid-October to April because of bats. Michael M. went to TAG Fall Cave In. He took some younger cavers to a few suitable caves (Bible Springs, Mountain Cove Farm #1) on Thursday, thought twice about Neversink and chose a different pit. Friday he visited War Eagle Cave with a different group. Saturday he got past the Sometime Sump in Ulla Cave despite some light rain. Ulla has a lot going for it, including some of the most decorated passage he’s ever seen and rooms big enough for a helicopter to fly through them. He left TAG before the bonfire and, more importantly, the incoming tropical storm. Ken wanted to try out his new camera equipment, so he and Diana, Emily, Ava M., and Pete went to Smokehole Cave. It was a fun trip with a lot of photography, and his new lens did really well. Read his trip report and see photos here. Ken talked about several caves in the Virginias that are owned and managed by groups of cavers. Who are we (and what do we like about the holiday season)? The museum has moved next year’s Darwin Day event from February to November, 2018. Please email Martin if you pay your dues via PayPal so that he can add you to the list of members. If you have feedback on this year’s annual grotto trip, send it to a grotto officer. Officers had another meeting immediately before the September monthly meeting. See website or check your email for those meeting minutes. Grotto trip: Ken, Mark, Peter, Kim, and about 15 other people went to Porter’s Cave. They spent a good bit of time trying to find the cave entrance despite having both accurate directions and GPS coordinates. Ken was glad that he had spent so much time studying the convoluted cave map in the fieldhouse, because it helped him determine that they wanted to get down to the lower level early on. There were lots of pretty formations, even some hanging from the pendants. They also encountered low crawls, chimney climbs, keyhole passage, and some mazey areas. 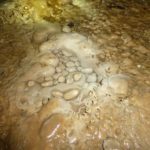 Grotto trip: Meanwhile, Zeke, Diana, Emily, Eric, Lilea, and the Clawson family went to Blowing Cave. Due to the pinchiness of the pinch, three of the Clawsons backed out early in the trip. As Zeke put it, the map was from 1939 and didn’t show anything that we saw. Mud was the most noteworthy thing about this cave. We almost lost the remaining Clawson when he stepped and sank into a puddle of muck and it took three of us to free him. There was no decoration and no cave life. Grotto trip: Kim, Matthew, and others went to Island Ford Cave. Kim reported that this short cave was not just easy to find, it was impossible to miss due to the large entrance. They took the dry passage on the way in, stopped when they got to the wet crawls, and took the stream passage on the way out. 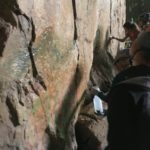 They saw a few salamanders and surprisingly little graffiti for such an accessible cave, and there were some formations in the smaller side passages. 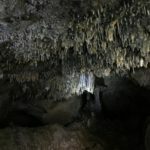 On his trip through South Dakota, Mark saw a Townsend’s big-eared bat in Jewel Cave, lots of boxwork in Wind Cave, and lots of algae in the commercial Black Hills Caverns. Mark and Rob attended CaveFest in Tennessee. 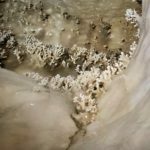 Mark’s first trip was to Cedar Ridge Crystal Cave. With no natural entrance, it’s very well decorated and hot. His second trip was to bounce a 180-foot pit at Cagle Chasm. His third trip was to Gourdneck Cave which had a pretty waterfall and some nice formations. It also had a large PVC pipe running through it that carries water to animals but gets in the way of cavers. Martin presented a program about headlamp batteries. We agreed unanimously to make a $100 donation to RASS. RASS requested a trip report that could help them promote use of their property. Ken suggested that Peter might be willing to share one, and Mark agreed to ask him. Someone on the trip should be prepared to collect and keep track of money from attendees. The campground and facilities were great and were close to the caves. 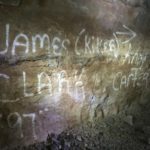 According to Ken and Mark, Porters Cave was worth going back to at some time. The organizers should choose caves that someone there has been to before. Martin has a list of the grotto members who have paid dues this year. He’ll send it out to the other officers. Martin has reimbursed Mark $40 for the four headlamp cases purchased for the loaner headlamps. We decided that Mark should purchase two 4-packs of the Petzl headlamp clips for helmet-mounting at $5 a pack, for use on the grotto loaner helmets that don’t have built-in clips. Mark suggested and we agreed that the grotto should buy a new Princeton Tec Vizz from him for $36 to replace the broken loaner headlamp. Officers finally chose the wording for the engraving on the NSS headquarters brick that the grotto agreed to buy for $100 last year. Mark will submit the form and payment. The grotto holiday party will be held December 9 starting at 6:30 pm at Mark’s house in Durham. Potluck. Send party theme or award ideas to Mark. Ken reminded us to pay dues if we haven’t this year. Dues are $7.50. Peter made an announcement about BugFest, an event happening at the museum on Sept. 16. Peter is looking for volunteers for his orthoptera table. No experience needed. Take two shifts and get a free BugFest shirt. (Absent) Mark has purchased cases for the grotto’s loaner headlamps and should have them in time for the grotto trip. Peter has some old incandescent headlamps that he’s ready to part with, in case the grotto wants such things. Ken recommends we bring it up with the other officers (and possibly with gearkeeper Mike). Oddly, among those present, there have been no trips to report since the last meeting! Also, Other Mark is willing to arrange cave trips to eastern Tennessee. After the program, we spent approximately 15 minutes discussing the meal plans, among other details, for the upcoming grotto trip.